Aluminium adjustment tool for use with the Centax II. Serpent is pleased to present this new tool specifically designed for use on the Centax II clutch system. 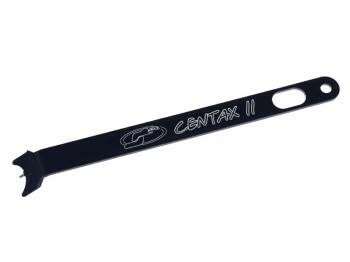 Featuring laser etched Serpent oval and Centax II logos this black coated lightweight aluminium tool allows you to easily adjust the settings of your clutch whilst still in the car. To use, simply place the pin at the end of the tool into the hole in the clutch bell and in turn into the groove in the clutch-adjusting nut and then turn the flywheel with your finger to adjust the clutch tension. Simple and precise and as an extra feature the large hole in the handle can be used to assemble the RCC shocks. 968-46 4 x 10 Bearing 2pcs.